Russian newspaper Izvestia reported that a Russian Air Force Tu-95 bomber overflew an Air France A319 passenger jet with a separation of about 100 m en route over Russia. Officials from Rosaviatsia reported that this report to be incorrect, stating there was no danger. On March 14, 2014, Air France flight AF-1645, operated by Airbus A319 F-GRXC, took off from runway 25L at Moscow’s Sheremetyevo Airport at 15:03 hours local time. Destination of the flight was Paris-Charles de Gaulle Airport in France. The flight climbed on a westerly heading. 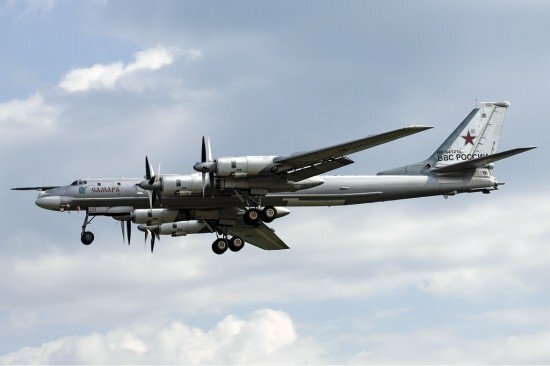 About 15:16, while climbing through an altitude of 8000 m, a large Tupolev Tu-95 four-engine turboprop strategic bomber descended from above towards the A319 from the southwest. Izvestia newspaper reported that it passed overhead at a separation of about 100 m. Rosaviatsia on the other hand denied this, stating there was a separation of 1000 m horizontally and 300 m vertically, which was within safety limits. At the time of the supposed airprox, the Air France flight was being handed over from the Moscow Center air traffic controller to another controller, according to Russian media.